Fishing for Happiness, Published by Sage Magazine, 2012, as winner of the 2012 Young Environmental Writer’s contest. Also available for purchase through the University of Washington Press and in Kindle edition. Just Enough travels inside the conflict zone of Thailand’s southernmost provinces and gets under the surface of traditional Malay Muslim culture. Mira Lee Manickam, an adventurous American researcher, takes us with her as she settles into a small fishing village in troubled Pattani Province. Stepping uncertainly into this deeply traditional world, she gains privileged access to a side of Malay Muslim society rarely seen by outsiders and obscured by the violence featured in Thai newspapers. 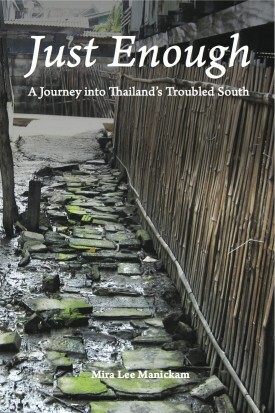 In a style that is humorous, honest, and moving, Manickam charts the southern Thai conflict through her travels in the region and tells the stories of her friends in the village: a gang of wild-haired teenage boys who observe conservative religious protocol by day and listen to heavy metal in back-street teashops by night; a group of young women too educated to find husbands in the village but too traditional to leave; an impoverished fisherman with a Zen-like stance on impermanence; and a dropout who immerses himself in Western culture as a star rock-climber in a nearby beach resort. These stories illustrate the tension between the values of a traditional Malay Muslim community and the demands of an increasingly modern Thai society. Just Enough is a personal journey of growth, loss, and friendship, and reveals the colors of daily life that lie beneath the black and white of newspaper headlines.